Oysters hang on long lines in the deep, cold waters, filtering water for food. 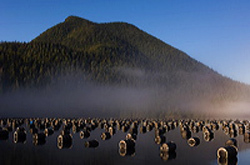 Currently about 50,000 gallons of Pacific Oysters are harvested annually in the Vancouver Island area. Next month is the height of of oyster season on the west coast of Vancouver Island. From November 15 to 18, ostreaphiles (oyster lovers)—and perhaps some other lovers who simply believe in the aphrodisiac properties of the little mollusk—will indulge their love of the briny creatures during the 11th annual Clayoquot Oyster Festival. For revelers who want to enjoy the festival in luxury, Long Beach Lodge is offering an Oyster Festival Weekend Package: a two-night stay for two plus tickets to two festival events hosted by the lodge. The first is the For the Love of Oysters dinner on Friday, November 16, where Executive Chef Jeffery Young shows off his talents with an array of oyster dishes served with regional wines. On Saturday, November 17, the Long Beach Lodge Winemaker’s Dinner features a “Pearl of an Oyster” dinner, with Vancouver Island guest winery Venturi-Schulze Vineyards and the double mouthwatering fare of Chef Young plus Chef Tim May of the nearby glamour camping wonderland, Clayoquot Wilderness Resort. Other Clayoquot Oyster Festival events include an educational talk, an oyster farm tour and a Mermaid Ball. For more festival information visit OysterGala.com. For more Lodge information, contact Long Beach Lodge at 1.877.844.7873 or visit LongBeachLodgeResort.com. At the recently-concluded 2007 Great American Beer Festival, more than 100 judges labored for three days to evaluate 2,793 beers. (For those of you who don’t consider this labor—it truly is). An impressive 222 medals were awarded in 75 beer style categories; top breweries and brewers were then named based on the total number of medals won. Brewers covet Great American Beer Festival medals as the highest recognition of their brewing talents and beer quality. Each year brewers send their beers to Denver to be evaluated by the festival’s Professional Judge Panel which looks to select the top three beers that best represent each style. Winners can tout their awards to customers and distributors to help build their reputations and sales.Among the 75 categories, American-style India Pale Ale continued to lead with the most entries; but there was explosive growth in the Fruit and Vegetable Beer category and impressive growth in the Wood-Barrel-Aged Beer category. The new category of Gluten-Free beer, with just 8 entries, is expected to grow dramatically as brewers recognize the size of the market of beer lovers with wheat allergies. This year, California brewers took the top prizes. Firestone Walker Brewing Company of Paso Robles was chosen as best Mid-Size Brewing Company and The Lost Abbey of San Marcos, brewed by Port Brewing, the best Small Brewing Company. 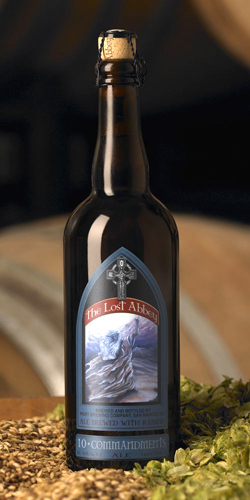 It is worth visiting LostAbbey.com just to read their philosophy and contemplate the beers (“Judgment Day, “Devotion” and others). If you live in one of the 25 states into which it is legal to ship beer, you can become a Patron Saint and order a Lost Abbey sampler pack. The rest of us need to petition our state representatives to repeal legislation that protects a few beer distributors and penalizes consumer craft beer enthusiasts. For a full list of winers in each of the 75 style categories, visit Beertown.org. Read more about craft beer in THE NIBBLE’s Beer Section. Ghiradelli Mint Bar. With the dark chocolate category growing 49% from 2003 to 2006, it’s no surprise that popular chocolate producer Ghirardelli has added three new flavors to its Intense Dark line: the romantic-sounding Evening Dream, Midnight Reverie and Mint Bliss chocolate bars. Evening Dream, a 60% cacao bar, is available in limited distribution in specialty stores and at Target. 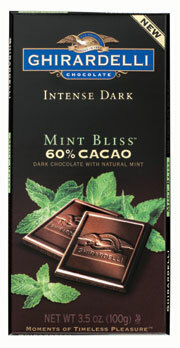 Mint Bliss, also a 60% cacao bar is available nationwide. Midnight Reverie will be available nationwide in January 2008 and has an 86% cacao content. It is targeted to the growing number of fine chocolate buyers who are going deeper into intense cacao. The bars are available for a Suggested Retail Price of $2.99 for 3.5-ounces. For more information, or to order chocolate online, visit Ghirardelli.com. Cheese lovers can indulge their passion in Orange County, California, November 16 to 18, when the first American Cheesemaker Awards, a celebration of great cheese, debuts. The event begins with a trade judging of the cheeses on Thursday, November 15, and a day of trade events on Friday, November 16. Consumers can participate beginning with the awards dinner, Friday evening. 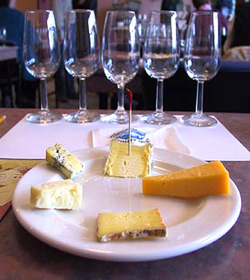 On Saturday and Sunday, the Cheese Tasting will offer the opportunity to savor cheese, wine and other fine foods and attend special culinary demonstrations at the Cheese Academy, where cheesemakers, industry experts and celebrity chefs will conduct exclusive cheese-inspired classes, including wine pairings, cooking tips and of course, more cheeses to taste. Daily admission is $75 per person and includes entry to the tasting and one Cheese Academy class (guests can attend additional classes at no charge if there is space). Tickets purchased before October 15th are $65 per person. Group rates are also available. Hotel accommodations at the Fairmont Newport Beach, where the event will be held, are available at a special rate of $169/night for attendees (requires booking by October 31st). Traveling companions who don’t want to focus on cheese can go shopping at Fashion Island, go to the beach or hang out at the hotel’s Willow Stream Spa. Visit Cheese Awards.com for more information. Taste cheese to your heart’s delight at the American Cheesemaker Awards. Some of Hotel Chocolat’s “luggage.” People who love luxury chocolates have a new destination: the website of Hotel Chocolat. The British company, founded 14 years ago, has just launched a U.S. website to enable Americans to try their lovely wares. The company makes chocolate with flair (the website photos show people in scenes that could be on the pages of Vogue), and makes bean to bar chocolate with beans from its own cocoa plantation, the Rabot Estate, on the island of St. Lucia in the Caribbean (the company also uses Ghanian cacao). 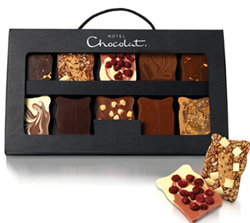 The company offers a selection of elegant chocolates, including its signature thick chocolate slabs in a variety of flavors and sizes, made by pouring the chocolate onto a chocolatier’s marble table and allowing the pieces to set. Packed in stylish black cases, they just beg to be taken for a weekend of tasting. THE NIBBLE will run a full review of the chocolate in the coming months.